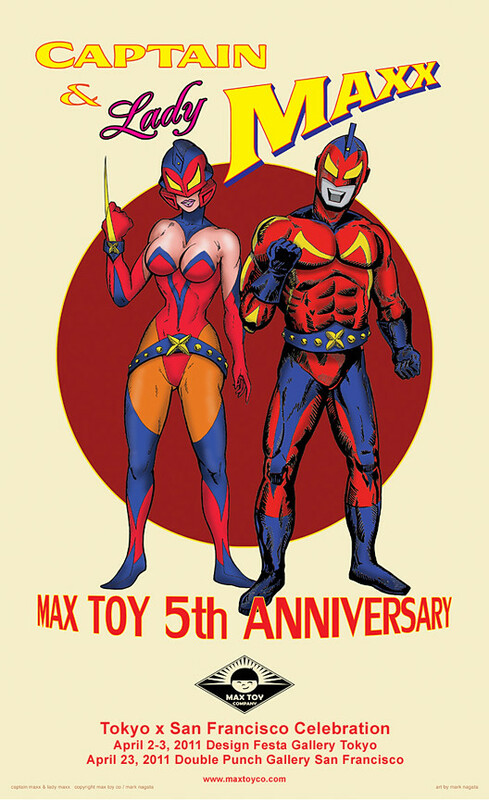 I feel very honored and fortunate to have been invited to the 5th Anniversary Celebration of Mark Nagata’s Max Toy Company. We (the participants) were asked not send in customized toys but instead come up with our own interpretations of the protagonists and antagonists of Mark’s fictional universe. It was not long ago that I came across the website captainmaxx.com which shows various (fake) vintage cases of packing design, tin toys and photos about Captain Maxx – Mark’s own version of Japan’s most well known superhero: Ultraman. 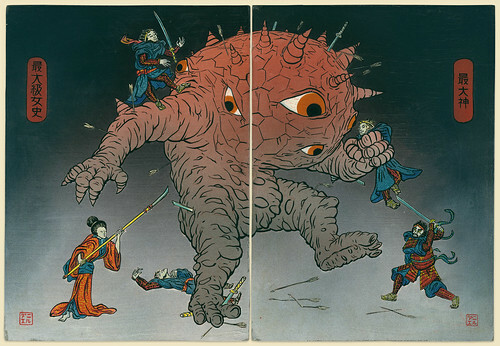 I liked the approach so much that I felt inspired to create my own attempt at turning Captain Maxx and his enemy Eyezon into a fake ukiyo-e print suggesting that the hero and his adversaries might actually be rooted in Japanese folklore, albeit relatively unknown. The diptych is painted on two panels of grey cardboard using ink, acrylics, brushes and airbrush. Each panel is slightly larger than A4 (ca 8×12 inch). 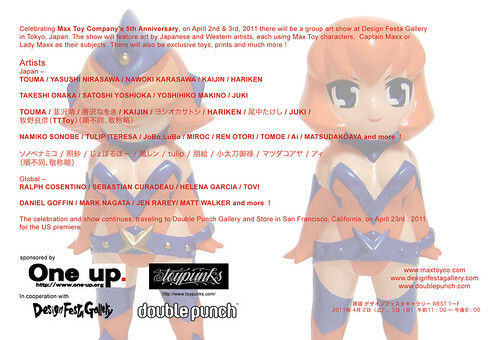 The painting will be shown in Tokyo April 2nd and 3rd and later at San Francisco’s Double Punch Gallery. Prints of the painting will be available later. Below are some images advertising the show.